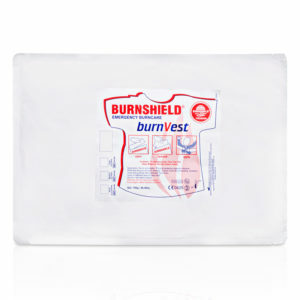 Burnshield Paediatric BurnVest: 50% of all burn injuries occur in the home, and the vast majority of the victims are young children. This unique product is effective in treating severe upper body burns on children from 6 months to 5 years old. Burnshield Burn Vest is the result of 2 years of development to determine the best fit and design for children. It has been tested and is supported by the Paediatric Burns Unit at the Chris Hani Baragwanath Hospital. The Cotton Burn Vest is manufactured from fibreless cotton for comfort and for maximum gel retention.